Acquiring a strong vocabulary doesn't have to be difficult. Vocabulary Power uses the latest research on memory to make this process simple, effective, and enjoyable. 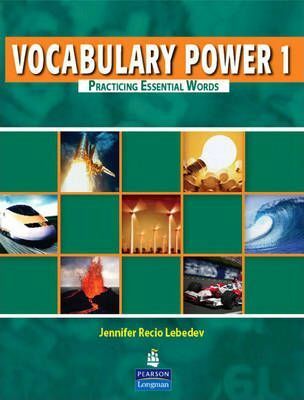 A three-book series, Vocabulary Power: *teaches the most important words from the General Service List (500 words) and Academic Word List (400 words)*presents each word in eight different contexts to help students learn and remember the word easily*encourages students to apply the words to their own lives, making vocabulary more relevant and useful*can be used in class or as a self-study text Each Vocabulary Power book features: *300 new words -- 10 per chapter* high-interest readings adapted from articles on a variety of up-to-date topics* exercises on word families, multiple meanings, collocations, and expressions that expand students' knowledge of the words* engaging discussion questions and writing topics that elicit natural use of the words* quizzes to check students' progress and minimize teacher prep time* Word Builder exercises and charts in the Appendix to help students focus on the meaning and use of word parts The Vocabulary Power series includes Vocabulary Power 1 (Low Intermediate), Vocabulary Power 2 (Intermediate), and Vocabulary Power 3 (Advanced).